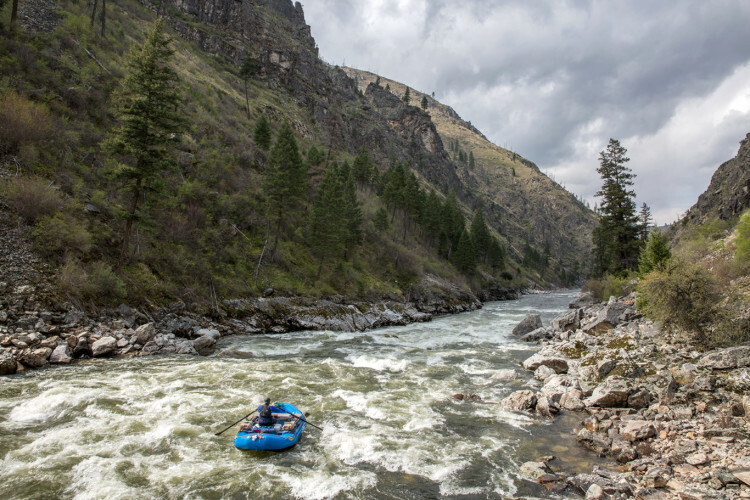 Rafting the South Fork Salmon in Idaho. Photo by Skip Volpert. The level was 3.69 Ft. Guides from the Middle Fork of the Salmon River decided to check out the other side of the Frank Church. Andrew Wilkin, Kevin Widerman, Colin Hughes, and Josh Edmunson. We did a 3 day, 2 night raft trip. First night we Camped at mile 14.7 on river left, above Mule Kick. Second night at the confluence of the Main Salmon. 14ft boats are a perfect size raft for this level. Enjoy the report below! For Oregon Boaters, I would compare the SF Salmon to the Illinois. It’s a run I’d describe as “land of the giants,” big holes lurking, huge horizon lines, and long continuous rapids with necessary moves. Similar to the logistics of the Illinois, the remoteness, shuttle, and changing flows make it difficult, but very doable for those who are motivated! First, to do this run you should understand the levels for a safe, good time. The gauge is measure here: http://waterdata.usgs.gov/nwis/uv?site_no=13310700. I would recommend 2.5ft to 3.7ft. Anything above 3.7, be careful. Once you have the gauge figured out, then you should organize a shuttle. Google the shuttle companies in the area, or call a friend from McCall. I like to break the SF into 3 sections. 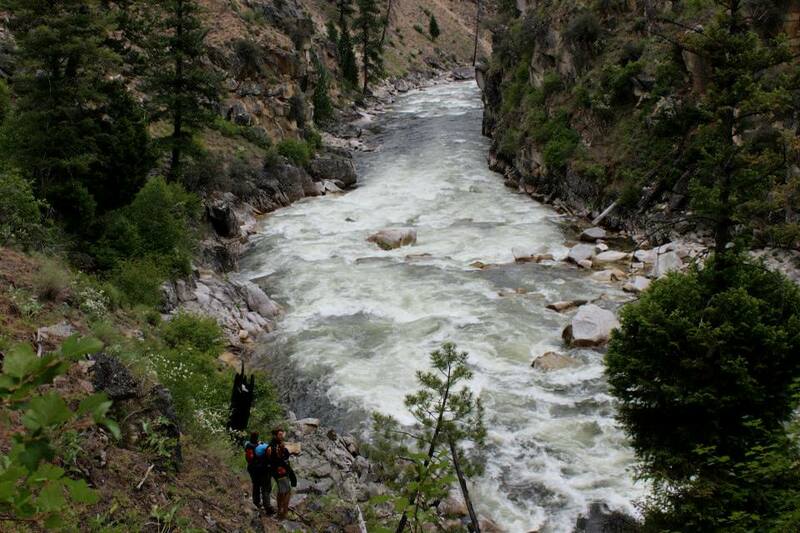 The first section is the put-in (confluence of the Secesh river) to Mule Kick rapid (mile 15). 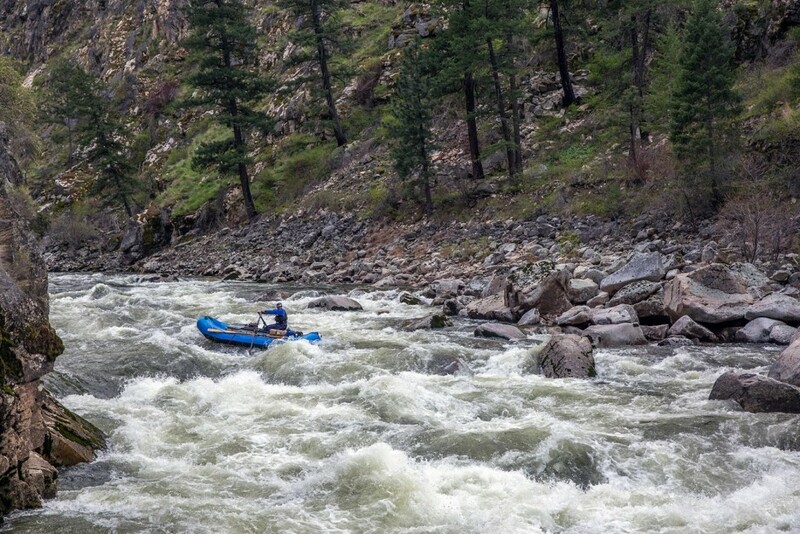 Second section, Mule Kick (Mile 15) to the Saw Mill (Mile 23), then the Saw Mill (mile 23) to Fall Creek rapid (Mile 32), the last big rapid on the South Fork. 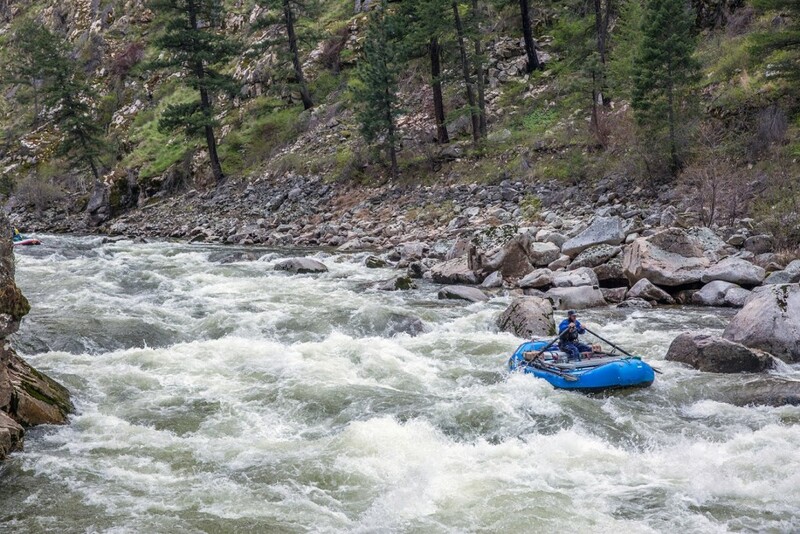 Section 1: From the put-in to Devils creek, be on your toes, lots of fun class III-IV boogie water. 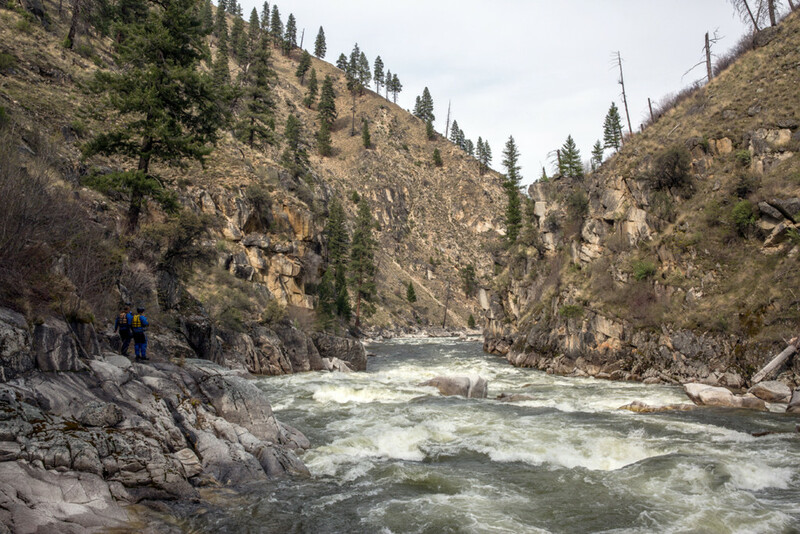 In no time you’ll be at Devils Creek, the first significant rapid at Mile 9. Scout on the left. 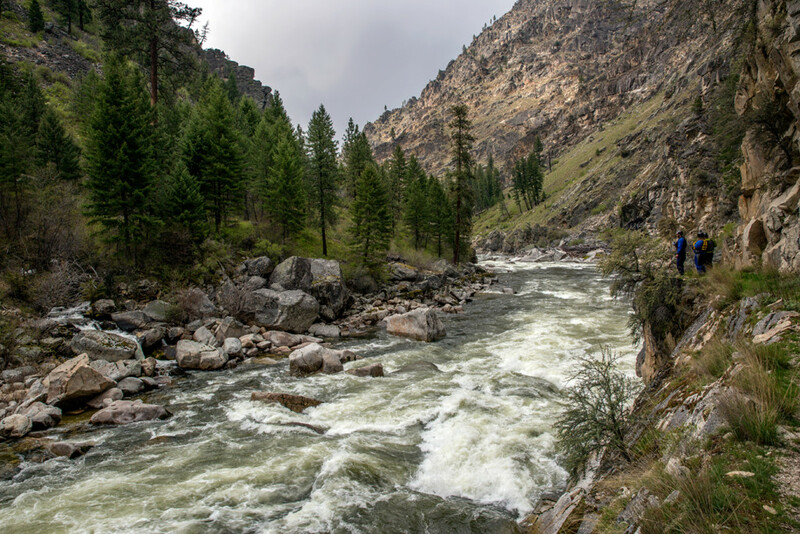 Devils creek is a tricky rapid, which has a history of wood being stuck in it. Make sure you scout and really inspect the last part of the drop. 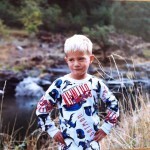 After Devils Creek, is a continuous set of read and run class III-IV. 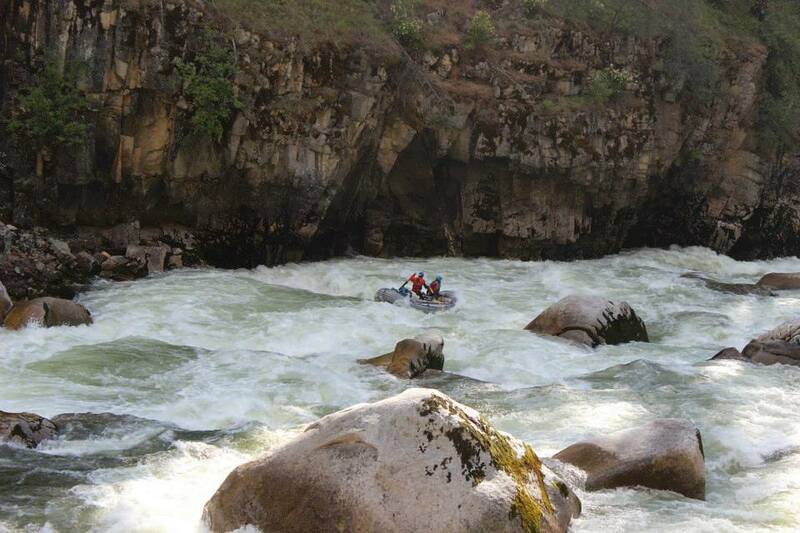 Be alert and ready to make moves, some rapids you will just have to just square and push through the big hits. Around mile 14ish is a stretch of sand bar camps on river left. Nice spot to stay, above the next set of rapids. Entrance to Devil’s Creek. Photo by Skip Volpert. Devil’s Creek on the South Fork Salmon. Photo by Skip Volpert. The second section: Mule Kick (mile 15) to the Saw Mill (mile 23). It’s tough for me to remember all the names of the rapids, just know there’s a plethora of rapids. I would recommend scouting most, if not all of them. Scout Mule Kick on the left, there’s a big pool above. Make sure to look for an eddy on river left below the rapid, Elk Creek is around the corner. Below Elk Creek is a spicy noodle plate of rapids. Be careful, hit em straight. The Sawmill at Mile 23. Photo by Skip Volpert. The third section, the Lumber Mill (mile 25ish) to the Confluence (mile 36.2). As the river begins to mellow, below Grouse Creek, you’ll notice a huge sawdust burner [note: we originally called this a “steam boiler” (see Ken’s comment at bottom of page)] on river left. Awesome structure to explore and check out. Note, the first rapid below the lumber mill is a technical class IV-V rapid. Far left is a undercut. No Bueno. Go center. After a couple more fun rapids the canyon will begin to narrow and you’ll be entering the last big section of the SF, buckle up! Once you enter the canyon the gradient will increase significantly. Lots of rapids. Near the end of the stretch, is Monumental rapid (mile 31). Run hey diddle diddle right down the middle, some big hits to be had. This is a key rapid to note. Below monumental rapid is the scout eddy for Fall Creek. The scout is on the right, there’s small sandbar with a noticeable trail. First part of Fall Creek. Photo by Skip Volpert. Fall creek is a 3 part rapid. You will want to scout all the drops. Once you push off in your boat it can be difficult to stop above the last drop. 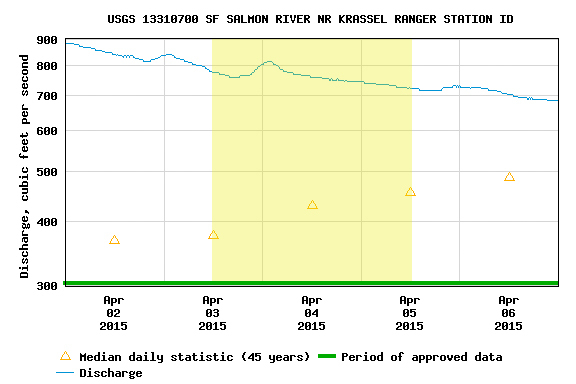 The Main Salmon confluence is at mile 36.4. You can spend the night at the confluence, and then float out the next day. Note, you’re not allowed to camp on the Main Salmon. From the confluence to the Main Salmon take-out is 23 miles. Drink beers and celebrate good times! Making the move in the first part of Fall Creek. Photo by Skip Volpert. Success! Photo by Skip Volpert. Last drop in Fall Creek. Photo by Skip Volpert. Always wondered about the South Fork. Thanks for posting that article. One minor comment: That’s not a steam boiler. It’s a sawdust burner. 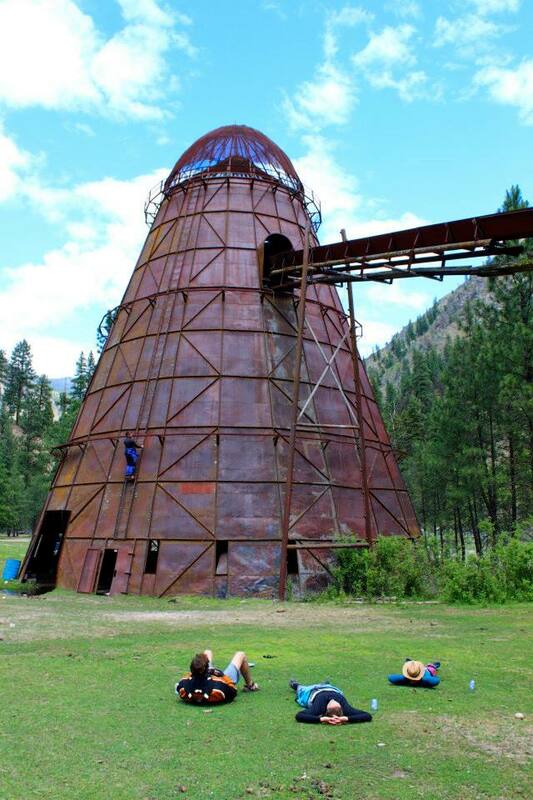 Every sawmill in Idaho had one of those up into the 1970s. They’d burn day and night, and glow red after dark. Hi Ken – thanks for the note and edit. Just fixed that. Hi Will, thanks for the great report. The SFK Salmon’s been on my bucket list for many years now. However, many other successful permits have swayed our attempts so far. Hopefully this next year I’ll make it? Yes, there are more campsites, but the sites are not as defined like on other rivers. Few sandbars, mostly benches. You will definitely have to keep an eye out for what you think is a good spot. With a small group, I’m sure you will find some nice camps. I’ve heard of people camping around the saw mill, and also below Fall Creek on river right. Wigwam burner for preburn for the boilers that are still there I believe. Amazing investment into that site that never panned out. Believe there is plenty of history and stories. Nice report and photos. The SF is equally exciting, but not as threatening, when running it in IKs at summer lows. I assume that cranky redneck who had a gold claim at the Secesh put in is no longer there? Nice pics and report. But you forgot to mention the rabid wolves, rattlesnakes that crawl all over your boats and into your sleeping bags at every rock strewn camp, and the redneck locals who are wannabe extras from The Deliverance. And hello again Mike Q.. Daddy Del is no longer there. That sign was there for years till it was taken out by epic high water, maybe 2011. Hi Ted. Glad to see you’re still on the rivers. I recall seeing an old 8mm movie of a hair run on the SF at real high water many years ago. Maybe even as early as the ’70s. 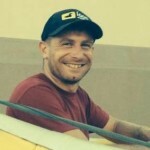 Lots of trouble, flips, near death, lost gear, etc. Amazingly, the movie footage survived. Anyone remember this movie? Know its title? Available on CD? Etc.? i heard that there are big holes on this river kinda like the Cal Salmon. Should i put rocks in the front of my boat?